What a treat and honor to see this feature in the newest issue of The Saturday Evening Post. I’m so excited to be able to bring this news – and a couple of screenshots – to you today. 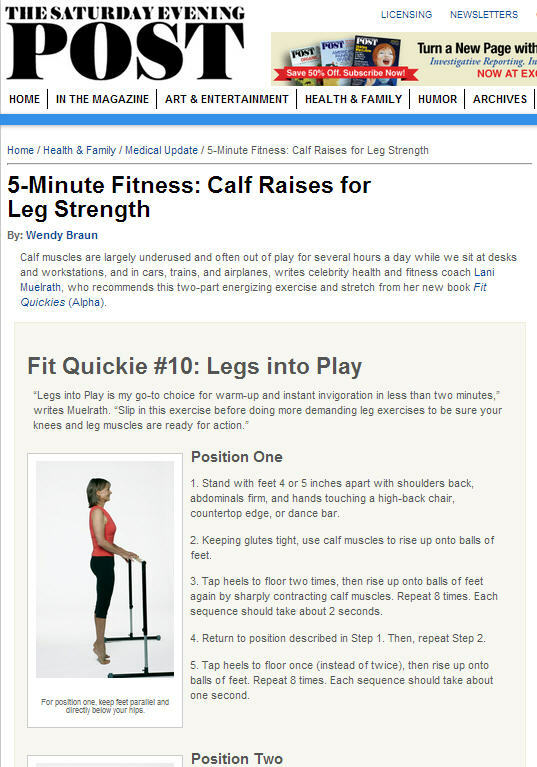 The Saturday Evening Post article (click here to read the article at the Post website) excerpted content from the Fit Quickies #10: Legs Into Play chapter in Fit Quickies: 5 Minute Targeted Body Shaping Workouts. My publisher – Penguin/Alpha – generously sent them images to use in same. Then, Saturday Evening Post created a short instructional video, which is linked at the bottom of the article (see screenshot, below). Gosh, if they’d only asked, I have this on video and would have gladly made it available! At the same time I know that many of these large publications like to make their own ‘in house’ video versions. Fine with me – actually, the instructor did a great job of making sure all my alignment details are in place – right down to the straight ankles, and the straight legs and the double taps, which is are my signature elements on this exercise. The shelf copy of The Saturday Evening Post should be in bookstores and magazines stands soon – if not already. It’s the September – October issue and I’m eager to see what portions of these features are in the hard copy. And should you come across a copy before I do, promise you’ll let me know! This is so awesome! I’ll check to see if the fall issue of the magazine is in the local bookstore. Congratulations on this great article! Thanks so much Sophie – it’s a very exciting development for sure!